The No. 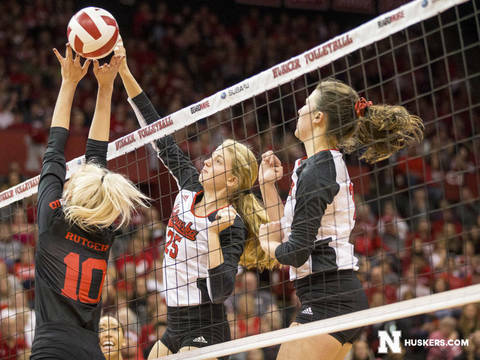 8 Nebraska volleyball team finished a perfect weekend at home with a dominant 3-0 (25-14, 25-12, 25-13) sweep of Rutgers in front of a crowd of 8,332 at the Bob Devaney Sports Center on Saturday night. The Huskers improved to 18-6 overall and 9-5 in Big Ten play, while Rutgers fell to 6-21 overall and 0-14 in conference matches. The nation’s top defense held Rutgers to a .024 hitting percentage. The Huskers were also sharp offensively, hitting .427, their best mark in Big Ten play this season. Nebraska had 12 blocks and nearly doubled Rutgers in digs, 37-19. The Huskers did double Rutgers in aces, 6-3. Nebraska also had a 41-23 advantage in kills. Mikaela Foecke had a solid all-around performance with 11 kills on .524 hitting with four blocks, four digs and four aces. Her four aces moved her past Allison Weston for ninth place in NU history with 123 career aces. Lexi Sun added seven kills on .308 hitting with three blocks, and Callie Schwarzenbach had five kills on .714 hitting with four blocks. Jazz Sweet terminated six times, and Lauren Stivrins had a match-best eight blocks to go with five kills. Stivrins finished the weekend with 18 total blocks after a career-high 10 against Penn State on Friday night. Nicklin Hames had a double-double for the 10th straight match and 18th time this season with 30 assists and 13 digs, which led all players. Sahbria McLetchie had eight kills for the Scarlet Knights. Set 1: The Huskers broke free from a 3-3 tie with a 6-1 run to go up 9-4. Sun had three kills on three swings to get NU off and running. Foecke and Stivrins combined for three kills and a block during a 4-0 spurt that put the Huskers ahead 19-10. The Huskers went on to win 25-14, out-hitting the Scarlet Knights .448 to .069. Foecke had six kills on .667 hitting. Set 2: The teams battled back and forth early with neither team able to grab a two-point lead until the Huskers went up 8-6 after back-to-back blocks by Stivrins, one with Sun and one with Hames. Foecke followed by serving two aces around a kill by Sun to make it 11-6 Huskers after the 6-0 run. Later, Schwarzenbach terminated and Stivrins served NU’s third ace of the set to increase the lead to 16-7. Schwarzenbach and Sun teamed up for a block, and Schwarzenbach added another kill for a 20-9 lead. The Huskers won 25-12, holding Rutgers to a -.182 hitting percentage. Set 3: Nebraska never trailed in the third set, jumping out to an 8-3 lead after Stivrins combined on back-to-back blocks following a Megan Miller ace. Sweet boosted the Huskers to a 15-8 lead at the media timeout with back-to-back kills. Rutgers went on a 3-0 run to cut the deficit to four, but the Huskers answered. Foecke keyed a 5-0 run with a kill and another ace, and Capri Davis had four kills and Sami Slaughter tallied two kills off the bench as the Huskers finished the set on a 10-2 run to win 25-13. Nebraska hit .560 in the final set. Up Next: Nebraska will play its next four matches on the road, beginning at Iowa next Wednesday at 7 p.m. Source: University of Nebraska Athletic Dept.